The fall of the Roman Empire in 476 (or at least the fall of the western half of the Roman Empire, the eastern half survived for a millennium after the “fall”) is one of the historical events which has attracted a lot of attention at least since Edward Gibbon’s “The Decline and Fall of the Roman Empire” and probably since the Empire actually fell. All sorts of explanations have been given as the reason for the fall of the Roman Empire; moral decay, civic disengagement on the part of the political elite, the unworldliness of Christianity, even the lead pipes used in Roman plumbing. While these explanations have some merit, in the end the Roman Empire fell because of bad decisions made by several Emperors as well as bad choices made by generations of ordinary Romans. There was nothing inevitable or preordained about the fall of the Roman Empire. The Roman Empire could have stood by centuries longer than it did, or it could have fallen centuries earlier. 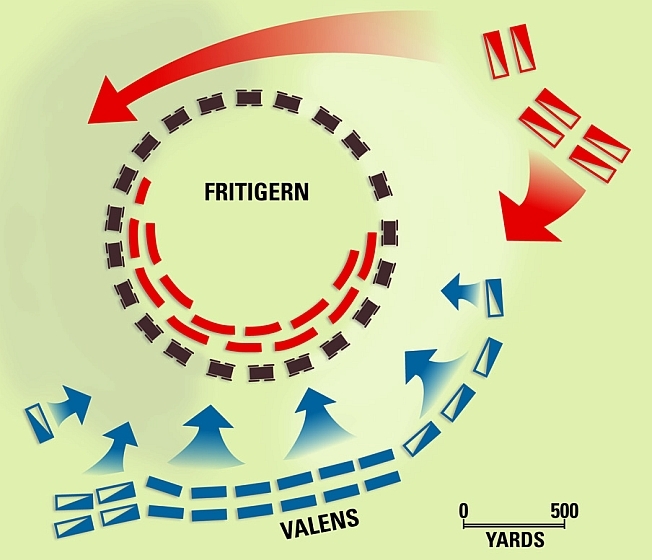 One of the decisions that, if it did not lead inevitably to the fall of the empire, at least weakened the Roman state and led to the destruction of the Roman army, was the decision by the Emperor Valens to admit the entire nation of the Germanic Visigoths into the Roman Empire, and several subsequent decisions by Valens which led to catastrophe. 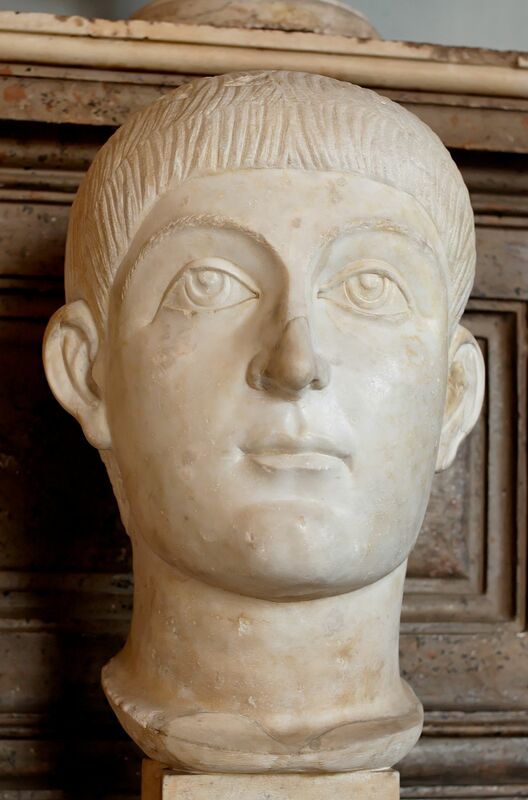 Valens was the brother of the Emperor Valentinian I, who came to power in the year 364. By this time, the challenges of ruling the Roman Empire had become so great that it was believed one man could not possibly rule the entire empire alone and as often as not, an emperor would have one or more co-emperors to help manage the burden, and so Valentinian made his brother co-emperor shortly after his own accession to the throne. Valentinian kept control of the western half of the Empire for himself and put Valens in charge of the eastern half. In the year 375, Valens learned that a vast number of Visigoths had appeared on the Roman borders at the Danube. The Visigoths were one of a number of German barbarians who lived beyond the Roman borders along the Rhine and Danube rivers. This border was always Rome’s greatest security threat, since the Germans often invaded Roman territories seeking plunder. The Roman legions had a difficult time repelling these raids and they were never able to actually conquer Germany because of the thick forests and fierce inhabitants. It was in the provinces along this border that were the most heavily defended in the Empire and where most of the legions were stationed. Of course, the relations between the Romans and the Germans were not invariably hostile. There was much trade across the borders and over time the Germans came to appreciate Roman civilization and even began to emulate the Romans. The Romans even hired Germans as mercenaries for their armies as Rome’s population began to decline and Romans became disinclined to join the army. Sometimes barbarians would be permitted to settle depopulated territories within the Empire, where they quickly became assimilated. As it happened, the Visigoths did not come as invaders, but as refugees. The Huns had emerged from Central Asia and had invaded the Goths’ homelands in what is now the Ukraine. The Huns had already conquered the Visigoth’s kinsmen the Ostrogoths, and the Visigoths had decided that they would rather seek refuge inside Roman territory and become Romans themselves than be subjects of the Huns. Valens was preparing for a war with the Persians, Rome’s traditional enemy to the east and he was delighted with the idea of filling the ranks of his army with trustworthy Visigoths, so he gave permission for some of the Visigoths who had been allies of Rome to enter. Because most of his troops were in Syria for the proposed war, there weren’t enough Romans in the area to properly supervise the crossing of the Danube and before long the entire Visigothic nation was settling in Roman territory. This might not have been a problem if the Gothic refugees had been properly handled. The Visigoths may have been barbarians but they were not strangers to the Romans. Many of these Goths had served in the Roman army and were familiar with the Roman Empire and its customs. Probably a great many of these barbarians spoke Latin or Greek. They were eager to become a part of the Roman Empire and if the Romans had settled them in the more depopulated regions of the Balkans and given them land to farm, while recruiting their young men for the army, the Visigoths would have a valuable asset to Rome. That is not what the Romans did. The Imperial officials in charge of handling relations with the Goths were corrupt, greedy, and incompetent. They disarmed the Visigoths and settled them in refugee camps. The Emperor Valens had promised to distribute food to the Visigoths until they could provide for themselves, but these officials withheld the provisions to sell to the Goths at such exorbitant prices that they were obliged to sell their children into slavery to eat. The Romans made it clear that the Goths were barbarians who could never expect to become really Roman. Naturally, the Goths were not inclined to put up with this treatment. They rose up in rebellion in 377 and defeated the Roman troops in the region. Now the Roman Empire had an enemy within its borders. The Gothic army won further victories against the local Roman forces and soon controlled much of the province of Thrace. Valens had to call off his war with the Persians and march west with his army to fight the Goths. Meanwhile, the Western Emperor Gratian, who had assumed the throne upon the death of his father Valentinian, prepared to march east to assist his uncle. By the summer of 378, Valens was ready to launch a campaign to subdue the Goths. By August 9, 378 Valens’s army had caught up with the Visigoths outside the city of Adrianople. The Visigoths had camped on a hill with their wagons drawn up in a circular corral, rather like the settlers during an Indian attack in an old western. The Romans seemed to outnumber the Goths and the Gothic cavalry was off raiding. It seemed that the Romans would win an easy victory. Valens’s generals advised him to wait for Gratian’s reinforcements before engaging the Goths, but Valens didn’t want to share the credit for the expected victory with his nephew. Valens led his army out to meet the Goths. The Gothic leaders were aware of their precarious position so they sent envoys out to parley with Valens hoping to buy time until their cavalry returned. The Roman soldiers, already tired after a seven hour march now had to stand at attention in the hot sun while their Emperor negotiated. Eventually the Romans had had enough and began to attack the Goths without waiting for orders. At first it seemed that the Romans would win the easy victory they expected, but the Goths pushed back their first assault. As the Romans were reorganizing for another attack, the Gothic cavalry returned from their raiding. The cavalry managed to surround the tired and thirsty Romans and the Roman army was routed. This was one of the worst disasters in the entire history of the Roman Army. The core of the East Roman Army, the best and most experienced soldiers who were led by the Emperor was destroyed and the Emperor Valens was killed. This was not the end of the Roman Empire. The Goths lacked the siege equipment to capture Adrianople and Valens’s successor, Theodosius I, slowly rebuilt the Roman Army and managed to defeat the Goths, ending the war on much the same terms as they had agreed to when they first entered the Empire. Yet, it was never the same afterwards. The myth of the invincibility of the Roman Army was shattered. The Romans had been defeated before and the Empire has been invaded many times, but always before the legions had managed to triumph in the end. After Adrianople, Rome was never entirely in control of its territory. In 410 these Visigoths sacked Rome and in 418 they established themselves as an independent kingdom in Gaul. I can’t but wonder if there is some parallel between Valens’s incompetent handling of the Visigoths and some policies followed by present day leaders in Europe. They have permitted large numbers of immigrants from the Middle East to come into Europe to alleviate a post-war shortage of labor, but they didn’t try very hard to assimilate them. Instead they made it clear that these Muslims would never really be French or German etc. Naturally the immigrants started to resent this and sought refuge in their religion, increasingly radical forms of Islam. It hasn’t helped that Europe’s intellectual elite has since lost all confidence in their own Western Civilization and are now inclined to appease the Muslim minority, no matter how outrageous their demands, thus earning the contempt of the Muslim minority. Is there a twenty-first equivalent of the Battle of Adrianople in the near future? If I were to mention the Roman Empire in any sort of word association context, many people might respond with some variation of “decline and fall of”. It seems that every historian or history buff who is at all familiar with the history of the Roman Empire thinks largely in terms of its decline and fall and they all seem to have their favorite theories why the Empire fell; moral decay, economic collapse, climate change, etc. The impression seems to be that Rome was somehow doomed to fail and that the only lessons to learn from Roman history is what great powers ought not to do in order to avoid their own decline and fall. Yet, Rome was an enormously successful state. For almost six hundred years, 146 BC to AD 410, Rome was uncontested ruler of the lands surrounding the Mediterranean, a feat unmatched by any of the many great powers since, and even after the “fall” of the Empire in 476, the eastern half of the Roman Empire, the so-called Byzantine Empire manager to last for another thousand years. No other, more recent, great power has managed such longevity. Perhaps the question we need to ask about the Roman Empire is not how it fell, but how a small, Italian city-state rose to rule the known world, and how they managed to rule for so long. This is the question which Anthony Everett seeks to answer in “The Rise of Rome”. In his book, Everett traces the history of Rome from its legendary, even mythical, beginnings to the generation before the rise of Caesar. Everett recounts the legends of Rome’s founder, Romulus, and its kings, the overthrow of Tarquin and the establishment of the Republic, and the wars in which the city fought for its life against its neighbors. Everett then considers what truth, if any, may be behind these legends based on the findings of archeology, while noting that the true events are less important than the fact that the Romans themselves believed the legends to be true and were influenced by them. The Republic slowly came to dominate Italy, in part because of Rome’s military prowess, Rome was an aggressive, militaristic state, but also because the Romans repeatedly demonstrated a statesmanlike common sense in their relations with defeated enemies and in their own internal politics. Here we begin to have somewhat more reliable historical accounts and we can begin to understand what the Romans were doing right. The Romans did not seek to destroy their enemies once they were defeated, but to have their former enemies join them. Italians could become allies in league with Rome and perhaps even gain Roman citizenship. Rome suffered from the same sort of class conflicts as the Greek city-states, but while the Greek factions usually tried to destroy each other, the Roman ruling class generally managed to find some compromise which kept the city together. More than any thing else, it was the Roman refusal to accept defeat and determination to continue fighting, even when their cause seemed lost, that led to the many Roman victories, as such warlords as Pyrrhus and Hannibal discovered. The Punic Wars were a turning point in Roman history. For the first time, Rome acquired territories outside of Italy, and by the end of the Third Punic War in 146 BC, Rome had come to dominate the Mediterranean. Rome had become a wealthy superpower. This success was not altogether favorable to the development of the character of the Romans. The Republican customs and institutions which suited an Italian city-state did not scale all that well to a mighty empire and the traditional good sense and willingness to compromise that had been displayed by Rome’s ruling class began to falter in the newly affluent society. Everett ends his account of the rise of Rome with the rebellion of Rome’s Italian allies, who, perhaps uniquely in history, did not seek to overthrow Roman leadership, but to be allow to become Roman citizens themselves, and rise and fall of the Roman generals and statesmen, Marius and Sulla, who set the precedents for Caesar’s dictatorship and the end of the Roman Republic. I can highly recommend “The Rise of Rome” for anyone interested in the history of the Roman Republic, particularly the early centuries that do not get nearly so much attention time of Caesar and the early emperors. Maybe we could learn some lessons in how to manage an empire. Meet Cato: Ancient Rome’s George Washington (thefederalist.com) Not really. Both the Elder and Younger Catos were jerks. They really don’t make popes like they used to. It is true that many of the Medieval and Renaissance Popes were very bad men and some were actually criminals. The Roman Catholic Church is fortunate that the general character of its popes seems to have improved considerably over the last few centuries. Modern popes may not be as interesting to read about as some of the more notorious popes of earlier ages, but they are perhaps more reliable in performing their pastoral and administrative duties. 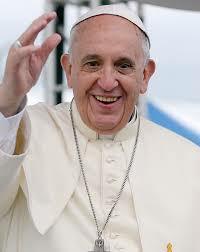 Still, if there are no remarkably bad popes in the present age, there are also no especially good popes either. Popes today are a rather bland lot compared to their predecessors. If there are no more Borgia Popes who assassinate their rivals or Great Schisms between rival popes, there are also no popes like Julius II who personally led armies into battle, Leo I who faced down Attila the Hun and convinced him not to sack Rome, or Gregory VII who made the Holy Roman Emperor Henry IV stand in the snow for three days before granting him absolution. Popes were far tougher in the past. 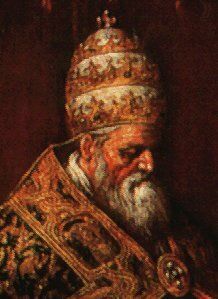 The toughest of these medieval popes had to have been Pope Honorius III. He was not content to vanquish mere earthly foes but, according to legend, he actually summoned demons from Hell in order to battle with them and send them back. 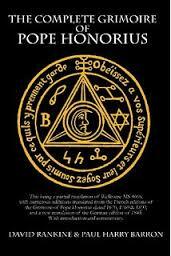 Even better, he wrote a book, or Grimoire, on summoning, controlling and banishing demons for the benefit of clergymen who might need such knowledge in their work. Pope Honorius III was the Demon Whisperer, at least according to legend. The sober facts about the life and papacy of Honorius III are impressive enough even without bringing in fantastic tales of his wrestling with demons to keep in spiritual shape. He was born Cencio Savelli in Rome in 1150. Savelli began his priestly career as canon of the Church of Sainta Maria Maggiore. In January 1188, he was made Camerlengo, or Chamberlain, of the Holy Roman Church. This post put Savelli in charge of Papal lands and finances and was perhaps a sign that he was considered honest and trustworthy. In February 1193, Savelli was made Cardinal Deacon of Santa Lucia and was acting Vice-Chancellor of the Holy Roman Church from 1194 until 1198. Savelli was dismissed from his post as Camerlengo of the Holy Roman Church in 1198 and given the post of Camerlengo of the Sacred College of Cardinals, making him the treasurer of the College of Cardinals. In 1200, Pope Innocent III raiused Savelli to Cardinal Priest. Meanwhile, in 1197, Savelli also managed to gain the post of tutor to the future Holy Roman Emperor Frederick II. On July 16, 1216, Savelli’s predecessor Innocent III died. Innocent III had been one of the most powerful and active popes of the Middle Ages and his reign would be a tough act to follow. Because of the unsettled political conditions in Italy, the College of Cardinals wanted to select a new pope quickly and they met only two days after the death of Innocent III, on July 18 at the city of Perugia. The College decided on Cencio Savelli as a compromise candidate acceptable to every faction and Savelli, somewhat reluctantly, was consecrated Pope Honorius III on July 24. Honorius was a popular pope, at least in Rome where the Romans were pleased to have a local as pope. He was also known for his kindness and generosity which endeared him to the people of Rome. Like Innocent III, Honorius III was ambitious for the Papacy to play a leading role in European politics, but he proved to be less inclined to use coercion against the princes of Christendom, preferring to use persuasion. It may be that Honorius was too ambitious and tried to get too much done during his reign. He wanted to recover the Holy Land for Christendom and promoted the Fifth Crusade. This crusade involved a campaign against Egypt from 1218-1221 and ended in failure. Most of the rulers of Europe had their own difficulties at home and were not able or willing to leave their lands for any length of time. Honorius’s former pupil Frederick II became Holy Roman Emperor in 1220 and was an obvious choice to lead a crusade. Although he promised Honorius that he would go crusading in the Holy Land, Frederick II kept putting off and delaying his departure until after Honorius was dead. In addition to promoting the crusades against the Infidel, Honorius also continued the French crusade against the Albigensians or Cathars begun by Innocent III. He supported the Reconquista of Spain from the Moors and missionary activity to convert the Baltic peoples, the last pagan holdouts in Europe. On a more positive note, Honorius endeavored to promote the spiritual reform of the Church. Honorius approved the Dominican, Franciscan and Carmelite orders and supported their reforming efforts. Honorius was a man of learning and strongly encouraged standards of education among the clergy, going so far as to dismiss illiterate bishops. He granted privileges to the Universities of Paris and Bologna and ordered arrangements made for talented young men who lived far from any universities to be taken to them and learn theology for the purpose of teaching in their own dioceses. Honorius himself wrote many books, including biographies of Popes Celestine III and Gregory VII as well as an guide to Papal finances. Even without the legends of wrestling with the supernatural, Honorius comes across as one of the more impressive figures to assume the Papal tiara. It may have been Honorius III’s reputation as an author and scholar that gave rise to the legend that he wrote a grimoire and summoned demons in his spare time. Naturally, modern historians do not give any credence to such legends. The educated in our secular age reject outright any suggestion of the supernatural, especially stories of witchcraft and demon summoning and few are inclined to suppose there can be any truth to such legends. Aside from that, experts on the history and theology of the Roman Catholic Church point out that any work of witchcraft or magic, including the act of summoning demons, is and always has been strictly prohibited by canon law and it seems unlikely that a pope such as Honorius III, who was at pains to promote Catholic teachings would go against those teachings. Still, the idea of a pope relaxing by summoning demons and then sending them back to Hell is a strangely appealing one, and I’d like to see one of these wimpy modern popes try to fight a demon. One of Honorius’s demons would chew him up and spit him out. That is, “Carthage must be destroyed”. These words were spoken by the Roman statesman and Senator Marcus Porcius Cato, or Cato the Elder at the end of every speech from around 157 BC to the beginning of the third and last Punic War. Who was Cato and why was he determined to have Carthage destroyed? Carthage was a city in North Africa that was founded by Phoenicians, or Punics as the Romans rendered the name, about the same time as Rome. Carthage proved to have an excellent harbor and an advantageous position for commerce and soon came to dominate the western Mediterranean, rivaling the Greek colonies at Sicily and southern Italy. While Rome was slowly gaining the mastery of the Italian peninsula, Carthage built an empire based on trade along the North African coast and the islands of Corsica and Sardinia, along with the western half of Sicily. Carthage was originally ruled by kings, but they steadily lost power and by 300 BC, Carthage was, like Rome, a republic. The Carthaginians spoke the Semitic language language of their ancestors in Phoenicia and their culture was much the same as that found in ancient Phoenicia or Canaan. Unlike the Romans, the Carthaginians were never a particularly warlike or militaristic people. They preferred to hire mercenaries to do their fighting. They were excellent sailors however, and had a first class navy. As Rome grew in power and completed its conquest of Italy, it was inevitable that the two powers would clash. The First Punic War lasted from 264 to 241 BC. The war began in Sicily between allies of the Romans and Carthaginians. Although there was fighting in Sicily, most of the First Punic War was a naval conflict. This was a problem for the Romans because they had no navy but the Romans proved to be determined and resourceful. They built a navy of ships copied from a shipwrecked Carthaginian warship. Since the Romans were unused to battles between ships, they invented a sort of boarding ramp with a claw or beak which they called a “corvis”, the Latin word for crow. 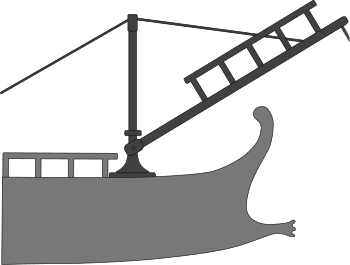 Instead of outmaneuvering the Carthaginian ships, the Romans would lower the corvis onto the enemy ship and Roman soldiers would board and capture it. In this way, Rome’s greatest disadvantage in the war was changed into their greatest advantage. The Romans won the First Punic War. They gained control of Sicily, Corsica and Sardinia and Carthage was obliged to pay a heavy indemnity. Naturally, the Carthaginians were unhappy with the outcome and wanted revenge. Carthage continued to prosper and the Carthaginians built a new empire in Spain under the command of one of their leading generals Hamilcar Barca. Hamilcar was determined to avenge the loss of the First Punic War and and his son Hannibal, considered to be the greatest general and tactician of ancient times, swore an oath of undying enmity towards Rome. The Second Punic War was fought between 218-201 BC. This was largely Hannibal’s war. 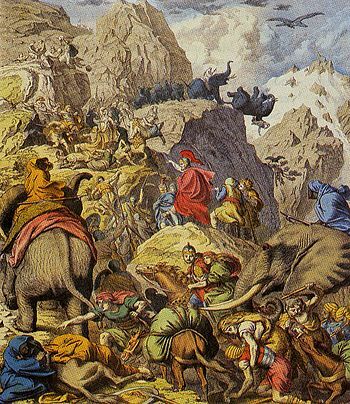 Hannibal concluded that the best way to defeat the Romans was to take the fight to Italy and so he gathered his army of Carthaginians and Spanish allies and march overland from Spain, through the Alps to Italy. Hannibal defeated every Roman army sent against him, often inflicting devastating casualties, but he lacked the men and siege equipment to actually capture Rome. Moreover, the Italian cities did not defect to his side in the numbers he hoped. Most Italians remained loyal to Rome. Once again,the Romans proved to be resourceful and they decided that if they could not defeat Hannibal, they could defeat Carthage by fighting where he was not. The Romans sent expeditionary forces into Spain and Africa under the command of Publius Cornelius Scipio Africanus. Eventually the Carthaginians recalled Hannibal to defend his homeland where the Romans under Scipio Africanus finally defeated him at the Battle of Zama, ending the Second Punic War. This time Rome wasn’t taking any chances that Carthaginian power might revive as a threat. Carthage had to surrender its possessions in Spain to Rome and pay a huge indemnity. The Carthaginian army was disbanded and Carthage was forbidden to raise another army or to declare war without the permission of the Roman Senate, which had no intention of ever granting such permission. Here Cato the Elder enters the picture. Cato was born in the year 234 BC in an old, rural plebeian family. He fought in the Second Punic War with some distinction and then entered politics. Cato was a “new man”, that is, he did not have any ancestors who held high office in the Republic. Since the Romans preferred political dynasties, he would normally be expected to rise very high in Roman politics. Such was Cato’s ability and reputation for virtue, however, that the Roman electorate was willing to overlook such a handicap. Cato was appointed quaestor in 204 and helped to supply the army that was sent to Africa. He was elected aedile in 199, praetor in 198 and Consul in 195. The following year he was sent to Spain to subdue the natives who had rebelled against Roman rule. He put down the revolt swiftly and ruthlessly and brutally and won a triumph in Rome for his successes. He also led military campaigns in Greece against the Seleucid Empire. His last public office was that of Censor in 184 but he continued to play a leading role in the Roman Senate for the rest of his life. 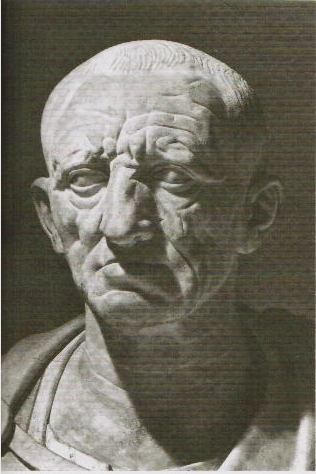 Cato the Elder was much admired by the Romans, both of his time and afterwards for his virtues. He was conservative and upheld the Roman traditional way of life and he detested the Greek culture that the Roman elite had begun to adopt. He was frugal, stern, disciplined, honest, and brave. Cato seemed to embody all the virtues the Romans admired. He does not seem to be all that attractive a figure in modern terms. He was stern to the point of cruelty to his family and slaves. He was a miser who worked his slaves almost to death and then sold them so that he could avoid the expense of caring for slaves too old to work. He was self righteous, very conscious of his own virtues, and I imagine, very conscious of others failings. He was kind of a jerk. In 157 BC, Cato was part of a delegation sent from the Senate to Carthage. He was alarmed to see that despite every Roman effort, Carthage was again prospering. Upon returning to Rome, He began to urge the destruction of Carthage. At the end of every single speech he made in the Senate, he would add, “ceterum censeo Carthaginem esse delendam” or, “Furthermore, it is my opinion that Carthage must be destroyed”. This is usually shortened to Carthago delenda est. In 151, Carthage finally paid off the indemnity and the Carthaginians considered themselves free of any further obligations to Rome. When Numidia, a neighboring kingdom and an ally of Rome invaded, the Carthaginians fought back. Cato and Rome was not pleased. The Carthaginians tried to negotiate peace with Rome and Numidia but the Romans were looking for any excuse to start another war. When the Romans demanded that the Carthaginians abandon their city and move inland, they refused and in 149 BC, Rome declared war on Carthage. This was not Rome’s finest hour. Carthage was defenseless and was no longer any threat to Rome. Nevertheless, the Romans acted as bullies provoking a fight against a weak adversary. The Third Punic War lasted from 149 to 146 and was essentially a siege of Carthage. The Carthaginians knew they had no hope to survive and fought a ferociously as those who have nothing to lose. In the end, the Romans captured and destroyed Carthage, killing or enslaving the entire population. Cato was not around to see his wish granted. He had died in 149. Hannibal had his revenge, eventually. Carthage was at too good a location to remain uninhabited forever and Carthage was rebuilt as a Roman colony about a century later by none other than Julius Caesar. No doubt Cato was rolling over in his grave. 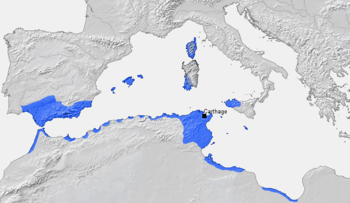 Carthage survived as the leading Roman city in North Africa until it was captured by the Vandals, a germanic tribe that had made its way all the way across France and Spain, into Africa, in AD 430. In 455, the Vandal king Genseric invaded Italy and sacked Rome. One can imagine the ghost of Hannibal smiling with satisfaction as soldiers from Carthage finally sacked his hated enemy, Rome. In 534 Carthage was taken back by the Romans under the the command of Belisarius, as part of the Emperor Justinian’s attempt to recapture the western half of the Empire. In 698, the Islamic armies captured and destroyed Carthage. This time Carthage was not rebuilt and the nearby town of Tunis took its place as the leading city of North Africa. Carthage still survives as a suburb of Tunis and is a major tourist attraction in Tunisia. Finally in 1985, the mayors of the cities of Rome and Carthage signed a treaty formally ending the Third Punic War and establishing a pact of friendship. There is no word on how Hannibal or Cato the Elder felt about that. Presumably Paul registered at Tarsus while he lived there. To get back to the census; obviously Joseph wasn’t a Roman citizen and Judea was under the rule of Herod, not the Romans. The census could have been a small time affair, the mention of Caesar Augustus being either an exaggeration or a long-standing policy of Augustus to encourage the provinces to conduct censuses, but conducted according to Roman norms, with every resident registering in his home town. You must not imagine, however, large crowds of people traveling to and fro. Remember that in this time most people would have lived their whole lives in the same village. Joseph’s journey from Nazareth to Bethlehem would have been very much an exception. The only thing really odd about this account was his taking Mary with him. There would have been no need for her to travel. As a woman, her residency would not have mattered much. Gaius Octavius Caesar, better known as Augustus is without question one of the most influential men in the history of the West. The story of his life and accomplishments is an astonishing one, and yet full of contrasts. He was the first emperor of the Roman Empire, yet he never used that title. Augustus began his life as the son of a relatively minor Italian aristocrat but became the most powerful man in Rome. He was the grandnephew and adopted son of Julius Caesar and used this connection to leap to the heights of Roman politics, yet his cautious personality was the opposite of Julius Caesar’s more flamboyant style. His rise to power showed a ruthless and often bloodthirsty deposition, yet when he had achieved absolute power, he governed justly and humanely. He had little military skill, unlike his grand uncle, but, with the aid of his friend Agrippa, he was able to defeat his rivals in the civil wars that ended the Republic. He was an absolute ruler, but he maintained the fiction that he had restored the Republic and scrupulously followed the forms of the old Constitution, while remaking Roman politics in a form that endured for the next two centuries. He always suffered from uncertain health, but he outlived nearly every one of his associates, including several possible heirs to his position. Augustus: The Life of Rome’s First Emperor by Anthony Everitt is a wonderful biography about the first Roman Emperor. Everitt tells the story of Augustus from his boyhood to his climb to power and his death. This is a sympathetic biography and while reading it, one feels exhilarated by Augustus’s victories and sorry for his losses, especially in his last years when it seemed that no one would be able to maintain the political structure he so carefully built after his death. 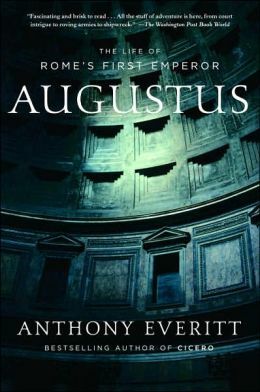 Everitt portrays Augustus as a statesman, who for all of his faults was concerned to leave Rome better than he found it. His influence lasted as long as the Empire lasted and on to the present day. Augustus’s last words were reputed to be, “Have I played the part well? Then applaud as I exit.” He certainly had played his part well. Caligula: Mad, bad, and maybe a little misunderstood (telegraph.co.uk) That may be true. A lot of what we know about the early Roman Emperors was written by people who thought the Republic should be restored. The stories of mad emperors like Caligula and Nero not be entirely true. Ever since the fall of the Roman Empire, people have speculated on the cause of that fall. In general, those who have indulged in such speculation have seemed to believe that Rome had some fatal weakness that made its fall inevitable. They have often gone on to point out that their own country has flaws rather similar to Rome’s and that the fall of their nation’s power is likewise inevitable. We, Americans have not proven to be immune to the temptation of comparing ourselves to the Romans and wondering if the decline and fall of the American Empire is just around the corner. John Stossel ponders this question in his latest column at Townhall.com. Unfortunately, the fall of Rome is a pattern repeated by empires throughout history … including ours? A group of libertarians gathered in Las Vegas recently for an event called “FreedomFest.” We debated whether America will soon fall, as Rome did. Historian Carl Richard said that today’s America resembles Rome. Sounds like New York City’s Mayor Bloomberg. The Romans were worse. I object to President Obama’s $100 million dollar trip, but Nero traveled with 1,000 carriages. Emperor Commodus held a show in the Colosseum at which he personally killed five hippos, two elephants, a rhinoceros and a giraffe. Nero reduced the silver content of coins to 95 percent. Then Trajan reduced it to 85 percent and so on. By the year 300, wheat that once cost eight Roman dollars cost 120,000 Roman dollars. Soon, to appease angry voters, emperors gave away or subsidized olive oil, salt and pork. People lined up to get free stuff. Doesn’t that sound like today’s anti-capitalist politicians. It might be useful to consider a few dates. Gaius Marius was consul in the years 107, 104-100, and 83 BC. The Claudius who ran for tribune is probably Publius Clodius Pulcher. He was murdered in 52 BC. Tiberius reigned as Emperor in the years AD 14-37. Nero reigned from 54-68. Commodus reigned from 180-192. Diocletian ruled from 284 to 305 and Constantine ruled from 306 to 337. The Roman Empire is generally considered to have fallen when the German warlord Odoacer forced the last Emperor Romulus Augustulus to abdicate in 476. This is not actually a very good date for the fall of the Roman Empire since government’s authority had collapsed outside of Italy about half a century earlier. Still, it seems that the excesses and follies of various Roman leaders which caused the fall of Rome took a long time to effect that fall. Actually, Romulus Augustulus was not the last Roman Emperor. There was still a Roman Emperor in the East at Constantinople. The Eastern Roman Empire, usually called the Byzantine Empire survived intact up until the Arab invasions of the seventh century. Even then the Empire survived in Greece and Asia Minor with its capital at Constantinople until the Turks finally captured Constantinople in 1453. It is true that the average citizen in Constantinople in 1400 lived in a very different society that the Roman in 100 BC. He spoke Greek, not Latin, was ruled by an autocratic Emperor, not a republic, and was a Christian, not a pagan. Still, that citizen of Constantinople never doubted for an instant that he was a Roman a true descendant of the people who had once ruled the world. The traditional date for the founding of Rome is 753 BC. Modern historians do not take the legends about Romulus and Remus very seriously, but 753 is probably as good as any other date for the beginning of the Roman state. If we consider Rome as having begun in 753 BC and ending in AD 1453 than Rome, as an independent state in various forms lasted for an incredible 2206 years. That is an existence longer that any other nation with a continuous history except for China and ancient Egypt. Rome was a major power from about 300 BC until AD 1100 or 1400 years. Rather than asking what caused the decline and fall of the Roman Empire, perhaps we should be asking how the Roman Empire lasted so long. Are there lessons to be learned from Roman history? Perhaps. We should keep in mind that Ancient Rome was a very different society than modern America. The Roman Republic became the Roman Empire, in part, because Roman political leaders stopped following the unwritten Roman constitution. We may be able to learn something, though There are signs that many contemporary American politicians view our constitution more as a hindrance to get around than a basic law to follow. I don’t think that our situation in America is like fifth century Rome. There are no Visigoths ready to sack New York or Washington DC. I think it is more like Rome in the late second century BC, a republic whose institutions are starting to break down. I am afraid that there is a Julius Caesar or Augustus somewhere who is fated to fundamentally transform the American Republic into the American Empire. John Stossel Asks, “Are We Rome?” (reason.com) No. DAYS OF LOT: Fall of Roman Empire caused by ‘Contagion of Homosexuality’ (endtimeheadlines.wordpress.com) Good grief! No, although a declining birth rate did cause considerable difficulties. There are, perhaps, only a handful of names from the ancient world that are still well known to this day. Among these, Gaius Julius Caesar must surely be one of the most familiar, even to those who don’t know much about history. A strong case could be made that Caesar was the most influential secular figure in ancient times. The changes he made to the Roman state shaped the course of history and politics for the next two millennia. We still use the calendar he introduced in Rome, with only minor changes. His name is synonymous with king or ruler in many languages (Kaiser, Tsar, Czar, and possibly Shah). Caesar truly was a colossus among men. Yet, in many ways, Caesar was an enigma. We know a lot about his policies and military campaigns from his own books and the writings of his contemporaries, yet his motives and ultimate designs remain a mystery. Did Caesar plan all along to overthrow the Roman Republic, or was he improvising, or was he an ambitious aristocrat in an age in which all the conventions were breaking down. Was he planning a major new campaign of conquest in the East when he was assassinated? Why did some of his supporters assassinate him? Did he intend to make himself King? 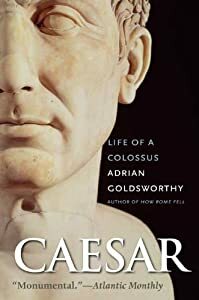 Adrian Goldsworthy attempts to answer these questions and more in his comprehensive biography of Julius Caesar, Caesar: Life of a Colossus. He begins by exploring the world of the late Republic in which Caesar was born. Even in his youth, there were signs that the Republic no longer worked as well as it did in centuries past. There were class struggles, military coups, and increasing lawlessness and egregious lust for power among the ambitious Senatorial Class. As he grew up, Caesar learned to play the game of power as well as any of his peers, becoming a prominent young lawyer and politician. Then he embarked on his remarkable military career. Goldsworthy notes that while he made some mistakes early in his conquest of Gaul, Caesar learned from them and soon became one of the greatest generals in ancient history. Although he was from the highest nobility, he developed a unique rapport with his men, who were willing to follow him anywhere. Caesar’s most controversial decision was to cross the Rubicon into Italy with his army, thereby seizing power and provoking a civil war. Goldsworthy explores Caesar’s motivations for this fateful decision and concludes that Caesar was more interested in preserving his safety and honor than in becoming dictator. Nevertheless, he did seize absolute power after he emerged victorious over his enemies. Caesar could be ruthless at need but, according to Goldsworthy, he was not a cruel man, and whenever possible, he preferred to pardon former opponents and sought their support. This proved to be his undoing, since several of his assassins, including Brutus and Cassius, were just such former enemies. Goldsworthy deals with each portion of Caesar’s life in as much detail as possible. He tries to stick, as close to the known facts as possible, but any biography of a person who lived so long ago must necessarily include much that is speculation. He also takes the opportunity to correct popular misconceptions about life and war in ancient times, which Hollywood and popular entertainment has been all too apt to spread. Overall, Colossus is a solid and readable biography about a most remarkable man. Julius Caesar was Once Kidnapped by Pirates Who Demanded a Ransom of 20 Talents of Silver, Caesar Insisted They Ask for 50 (todayifoundout.com) This is a great story. The pirates asked Caesar what he intended to do after they released him and he replied he would hunt them down and crucify them. Everyone had a good laugh, but when Caesar was freed he did just that. No says Daniel W. Drezner in Foreign Policy and Robert Kagan at The New Republic. Both articles are well worth reading. I am inclined to agree with both these men. We do have many problems, but Americans have always been adept at overcoming crises and the fundamentals of the American economy are still very strong. America is the leading power in the world, without any real competitors and seems likely to continue in that role for some time to come. I am not afraid that America will cease to be a superpower, or that some other nation will surpass us. My fears for my country are quite different. If I were to explain it in terms of Roman history, (which I really shouldn’t since modern America and ancient Rome are very different nations and societies, still), I would say that I do not believe we are living around 400 AD, with the barbarians crossing the border and preparing to sack Rome. Rather, I would say that we are around 130 BC. This was the beginning of a long period of political unrest and civil war that ultimately destroyed the Roman Republic and established the autocracy we know as the Roman Empire. The causes and events associated with the breakdown of the Republic are rather complicated and I won’t relate them here. The one development that is worth mentioning, however, is that about this time Roman politicians ceased to follow the rules. More and more they began to operate outside the unwritten Roman constitution, even to the point of building their own armies. More and more, the ruling elite of Rome was less interested in the good of the nation and more concerned with maintaining their own wealth and power. At that time Rome was master of all the lands on the Mediterranean. Although the empire had not yet reached its furthest extent, Rome was a superpower with no competitor.Unfortunately, the Roman rise to power had destroyed the small farmers who had been the backbone of the Republic. The longer wars meant that they had to neglect their lands and many went into debt and lost their land. Beginning with the Gracchus brothers, many politicians tried to enact policies to help the poor, either because they were sincerely interested in helping them, or they hoped to use them to gain power. The Senate refused to consider any real reforms, so the populist leaders began to work around them, sometimes in ways that were unconstitutional. In response, the elite began to use unconstitutional means, including murder, to maintain their power. Eventually the Republic was wracked by civil war until Augustus Caesar took power and became the first Emperor. I think you see where I am going with this. The thing that causes me the most anxiety is the increasing lawlessness of our political elite. When we have a President who simply ignores the constitution or a Speaker of the House who simply laughs at the idea that the Constitution might not allow something like Obamacare, I begin to sense we are on the same trajectory ancient Rome was on. It seems to me that our leaders are no longer willing to follow the rules. It may be, decades from now, or sooner that America will be ruled by a Caesar. We will still have elections. Congress will still meet and pretend to pass legislation. But everything will be under the control of Caesar and everyone will know it. America will probably still be a superpower a century from now. I am not sure it will still be the kind of country I would want to live in. Lately, I have been reading Ancient Rome: The Rise and Fall of an Empire by Simon Baker. This is, obviously a history of the Roman Empire. I am up to the time when the Republic broke down over the stresses caused by Rome’s rise to empire and the Republic’s transformation into the dictatorship we call the Empire. This process began when the political elite of Rome thought only of their own selfish interests and no longer considered the interests of the governed. Conditions became so bad and the leadership so corrupt that the dictatorship of Julius Caesar was preferable to the rule of the Senate. Why does all of this seem strangely familiar? Is the American Republic doomed to become the American Empire? Is there, even now, an American Julius Caesar out there planning to seize power? I hope not. Maybe we have managed to arrange things a little better than those old Romans. Then again, their republic lasted almost 500 years before it collapsed, and the Empire lasted another 500 years. We will be lucky to last half as long. The Gracchi Murders (pinkbananaworld.com) The assassination of the Gracchi is what started the downfall of the Republic. Here is what started me on such gloomy reflections. Jackson called for full government employment of the 15 million unemployed and said that Obama should “declare a national emergency” and take “extra-constitutional” action “administratively” — without the approval of Congress — to tackle unemployment. The Republic no longer functions. Hail Caesar Obama! !